Social Media. This is Must Know Information for Financial Advisors. Most everyone is aware of how large social media is in the world we live in today. However, understanding the impact social media has on your financial social network for financial advisors is sometimes not completely comprehended fully. Social media is growing every second. Facebook has nearly two billion users, LinkedIn has around 500 million users and Twitter has more than 300 million users. These platforms aren’t going to stop growing any time soon, so there’s some important information financial advisors must know about social media in general to stay ahead of the competition. If you aren’t sure exactly how powerful social media is, just compare it to other media outlets from a historical perspective. Radio took 38 years to reach 50 million users, television took 13 years to reach the same amount, the Internet took four years. And social media? It only took two years to reach 50 million users. It’s safe to say social media marketing for financial advisors is here to stay, and will only grow in importance. Most of your current clients and prospective clients are likely using at least one form of social media today. And when the vast majority of your competitors are utilizing social media, you can only imagine the role social media marketing for financial advisors will play in your future. When it comes to social media and financial services, the odds are in your favor that your next client will come from your financial social network. In fact, studies have indicated more than 85% of new clients come from referrals. So it’s easy to see how a larger and more active network will create more referrals and generate more business. Developing a social media strategy for your advisors to increase the number of business connections and raise their level of engagement will prove valuable. One of the best strategies for doing so is to create engaging and relevant content on a consistent basis to attract people to your firm. SocialFinServ not only helps financial advisors understand the importance of social media, but we also help advisors use it most effectively. 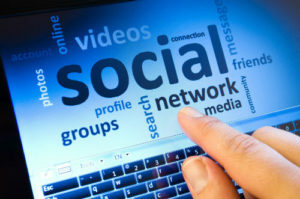 We help firms comprehend the connection between social media and financial services by providing an all-in-one solution to maximize outreach and boost your bottom line. There’s so much to know and learn about social media, and we are here to help. Be sure to contact us to learn more about how our solutions can help your firm thrive.